Performers include: Carolyn Jones, John Astin, Ted Cassidy, Jackie Coogan, Ken Weatherwax, Marie Blake, Lisa Loring, Felix Silla, Anthony Magro, Parley Baer, and Eddie Quillan. Based on the cartoons of Charles Addams, this family is anything but typical. They delight in the macabre and live in a creepy museum that closely resembles a haunted house. 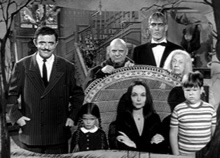 The crazy characters include happily married couple Gomez and Morticia (John Astin and Carolyn Jones), their two young children Wednesday and Puglsy (Lisa Loring and Ken Weatherwax), Uncle Fester (Jackie Coogan), Grandma (Blossom Rock), butler Lurch (Ted Cassidy), Cousin Itt (Felix Silla), and a dismembered hand, Thing (Cassidy). Morticia’s sister, Ophelia (Jones in a blond wig), arrives at the house in tears. She’s been jilted once again. Morticia suggests that Ophelia find a career, to take her mind off of her man troubles. Cousin Itt offers to teach her to sing. Unfortunately, when Itt finishes instructing her, she sings like he talks. Gomez hires Signor Bellini (guest Ralph Rose) to help but he has little patience and threatens to quit. Ophelia tries to sing choral music, and in a chorus of voices, she is wonderful. This shocks Bellini. Six months later, she’s going to audition for a great impresario, Signor Rudoipho (guest Ben Wright). To calm her nerves, Fester gives Ophelia a throat tonic that ruins her voice. Morticia tries to console her sibling by writing a new opera for her, Afternoon in a Swamp. Ophelia tries singing again and even makes a record. She sends a copy to the family. Ophelia now has a two-tone voice, both alto and bass. First aired: April 8, 1966. On September 23, 1972, the Addams clan returned as animated versions of themselves in an episode of CBS’ The New Scooby-Doo Movies show. Astin, Jones, Coogan, and Cassidy voiced their respective characters. The Addams family returned in their own animated show a year later, on September 8, 1973. In the new show, the Addams took to the road and traveled around in a strange RV that looked like a Victorian house with wheels. Fester was retconned to be Gomez’s brother and Grandmama was now Morticia’s mother. New characters include Abigail the bat, Ocho the octopus, and Ali Gator. Only Coogan and Cassidy voiced their old characters. The animated series lasted 16 episodes and two seasons on NBC. The original show continued to be popular in syndication so a live-action reunion movie was made with the possibility of a new weekly series to follow. On October 30th 1977, CBS aired Halloween with the New Addams Family. The movie reunited most of the original castmembers, with exception of Blake who was quite frail. She was replaced by actress Jane Rose (Phyllis). Weatherwax and Loring had grown up and their characters now had children of their own, Wednesday Junior (Jennifer Surprenant) and Pugsley Junior (Ken Marquis). The movie, videotaped in color, didn’t recapture the humor of the black and white series. It was shot on location in a real house and was missing most of the familiar special effects. Though heavily promoted, the movie wasn’t very successful and any plans for a new series were scrapped. In November 1991, The Addams Family, a big-screen version of the gruesome group hit theaters. The dark comedy drew much of its inspiration from the original drawings but some bits of the TV show survived — including Thing and the iconic theme song. None of the TV show actors appeared. The film was very successful and spawned a sequel, Addams Family Values. That wasn’t nearly as successful but a made-for-video sequel called Addams Family Reunion followed. Few performers from the two theatrical movies returned to their roles. In 1992, another Addams Family animated series debuted. It bore more of a resemblance to the feature films than the TV show but Astin returned to voice Gomez once again. It ran for two seasons and 38 episodes. 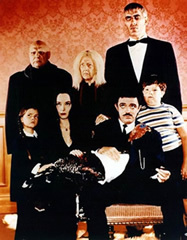 On October 19, 1998, a Canadian series named The New Addams Family premiered on Fox Family. It attempted to recapture the feel of the original TV series but was wilder and more effects-laden, like the movies. It ran for 65 episodes. Astin portrayed Grandpa Addams, Gomez’s father, in a recurring role. A new musical is headed for Broadway but will emulate the original Charles Addams magazine cartoons. Not that you will read this being like 1 1/2 yrs after your post, but I believe that Lurch, Grandmama, Uncle Fester, It, Thing and Morticia are all dead now. Gomez (Astin) is still kicking as far as I know, but not very active in the acting world any more. There was something like a “where are they now” bit done when Aaron Spelling died, and since his ex-wife played Morticia, they covered some of that. I can’t for the life of me remember what happened to Wednesday and Pugsley however.